Whatever the inconveniences, it is good to see the Strand being put to use in this way. Mayor Martin Walsh has put the Strand on the map as a venue for rallies such as this one. He held two big events at the Strand last year. 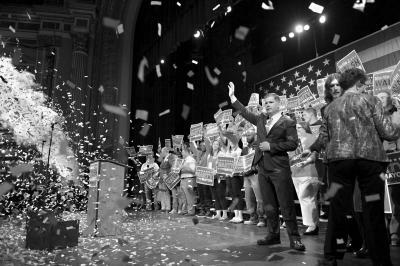 The first, in May to kick-off his candidacy , drew a big crowd. The second, on the eve of his big win last November, was even bigger and showed that a diverse audience can and will get themselves to the theatre when they have a compelling reason to go there. These are all encouraging signs for the city managers and the private producers who hope that the Strand will also become a thriving venue for the arts. In particular, the Fiddlehead Theatre Company , which is now the official resident company at the Strand , is banking on getting theatre-goers to come there with regularity over the next year. Getting theatre-goers to come to Dorchester, though, has always been a hurdle .